What would you expect a group size to be? 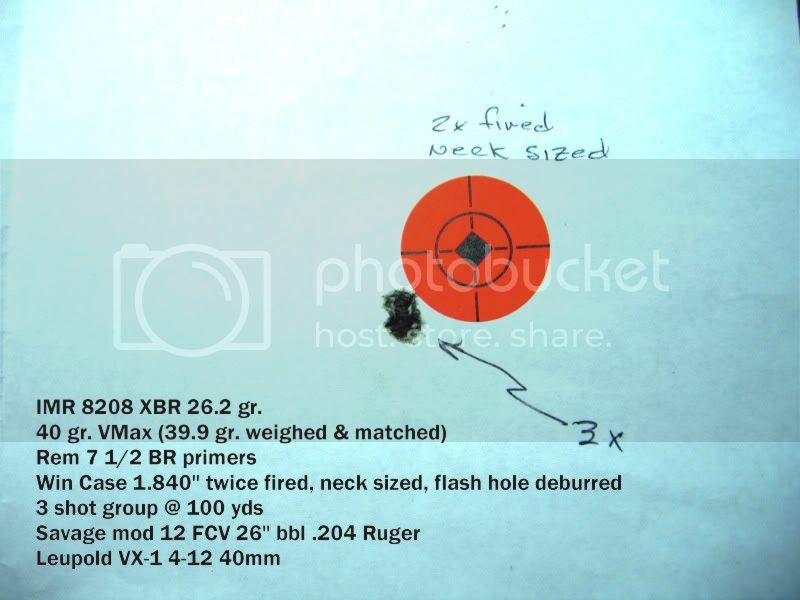 Rifle zeroed at 200yds shoots 1/2inch group what would the group be at 100 @ 300 yards. Rifle zeroed at 300yds shoots 1/2inch group what would the group be at 100 @ 200 yards. Not worried about bullet drop or bullet drift just the group size. That will depend on the bullet weight and velocity you are starting off with. If you have a rifle shooting half inch groups at 300 yards... that is a keeper. 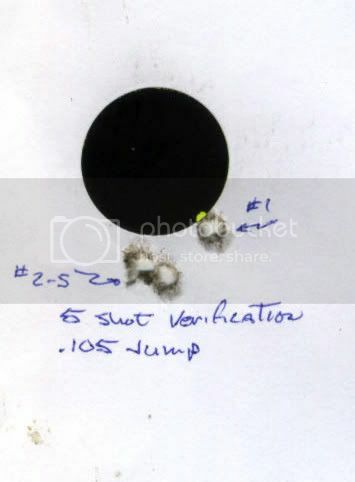 With a "perfect bullet" under "ideal conditons" from a shooting platform able to hold and break thej shot perfectly, you would expect the group size to be the same in Minute of Angle at he different ranges. Since MOA is roughly 1 "@ 100 yards,(1.05") in Scenario one -expect a 1"group at 200 and a 1.5" group at 300. Scenario 2 - 1/4" group at 100, 0.75" at 300. I think yogi Berra said in theory it is the same as practice but in practice it never is. Well, logically, you would expect the groups to be about what dogdad described. But, there is an interesting phenomenon having to do with bullet yaw/stabilization. In some cases, at 100 yds the bullet hasn't "gone to sleep" yet. The nose is still in precession and the group could be larger than you'd expect. At 200 yds and beyond, it has stabilized and you would get a tighter group. Also depends upon bullet shape, a short fat softpoint will stabilize before a pointed bullet will, but will loose velocity quicker. When a bullet exits the muzzle, it's not stable. It's yawing or that is to say the meplat (point) and the general consensus is that the pointier the bullet profile, the further it travels down range before it's stable or "Gone to sleep." * The longer the bullet overall length, the faster twist the rifling must be and the longer it takes the bullet to settle in. Might want to be. Bullets are better on the way up vs. on the way down on the backside of the trajectory for various reasons or so I've read. So the whole question has me kinda scratching my head some so...but in a sterlie condition I'm not sure. And +1 Haycreek and Omni. Last few loads I've done are 2" or so high @ 100y and that's about even @ 200y give or take and I saw one stay about the same and one get tighter @ 200y. So test @ both before ya confrim! I've seen HS films of 338 and 50 cals I think it was and you can really see the thing's base trying to pass up it's nose all wee waw till it settles down, whoda thunk it! "Not worried about bullet drop or bullet drift just the group size". I know there will be wind drift and drop depending on range and conditions. I was wondering what happend to the group size in a neutral condition :-) and what would be a better range to zero at. Depsnds on a million things...laod, range and game size. Check out the thingy at the top with the big elk in it. Will be for fox using a .243 55gn heads range 100 to 300 yards. Was thinking about a .204 for the job. Ok, gotta admit I'm biased in this case. I'm a .204 nut and that's what I use. .243 is a good round but the .204 uses less powder, is capable of .2" groups or better and has minimal recoil. At the ranges you're talking about, it will perform beautifully. I've dusted prairie dogs at 450 and know it will still drop a coyote at 500. If you want a varmint/deer rifle, you might look into the .260 Rem. A friend of mine just got one and I'm dying to help him check it out. Nice shooting HayCreek. Figured this had to be a Savage. Mine in .223 shot similar groups. With the scope I had on it, I used a 300 yard zero. Made it pretty easy for long range shooting at Pdogs and coyotes. Had to chuckle at your comment. Only a Savage owner would get that feeling. Yup, gotta love those Savages! Not to put down Cooper, but I was looking at one with its test target and thinking "Heck, my Savage will do that and I can sure load a lot of ammo for the difference in price." 300 yd zero sounds good. Been looking at some ballistics and thinking if I zero thereabouts my MPBR should put it out to about 340 or so. you guys and your super accurate .204s! I think my latest .223 will do as good. It sounds like the .204 for pd's and yotes is hard to beat. +1 Savage. My .223 X10 predator with the right load is the most accurate shooter I have ever owned. With the Millet mil-dot scope and a bit more practice at ranging I am feeling pretty good about start going after coyotes after the big game season is over. That is damn fine shooting HayC, although no doubt the calibre had a bit to do with it mate. I have a .243 for hunting out here in Oz...it's a back up for my Mod 94 in 30.30, or is that the other way around? Gittin' confusalated these days. Seriously though, no prairie dogs out here, just bunnies and other feral critters like deer, foxes, cats, dogs, pigs...and the big boys out West...donkeys, camel and Asian water buffalo. My .243 shoots into .7" at 100 metres if I do my bit and will handle any of the first group, but for the big guys you need BIG boollits. Nothing wrong with a .223. You can launch a heavier bullet. But, havin' my 'druthers, I chose the .204 for the flatter trajectory. Yup, good platform and the right load. I picked up a Viper PST FFP 4-16x50 with Mil/mil. Love the ranging, hold over and windage ability with mil/mil. I'm working up a table of sizes to help my ranging. Knowing the approximate size of a coyote in mils at different ranges will help you quickly verify your estimate. Also. working out a reasonable MPBR can make up for small ranging errors. Thanks and no doubt the rifle and caliber had a lot to do with it. At least I know when I blow my groups, it's all me. That's good shooting with the .243. Lots of guys out here use it for deer. Got tired of getting beat up with the big bores. The only one I have interest in is my .45/70 hi-wall. And I load that down to about 1200 fps for silhouette shooting.